/tmp directory is mounted noexec. Installation cannot continue. The error is caused by the noexec option been set for the /tmp mount point as a way of security protection against unauthorized access. With noexec flag, you cannot run or execute binaries and executable that are on the partition. Normally, noexec option is normally set in /etc/fstab configuration file, while one can also mount a filesystem manually with noexec option. 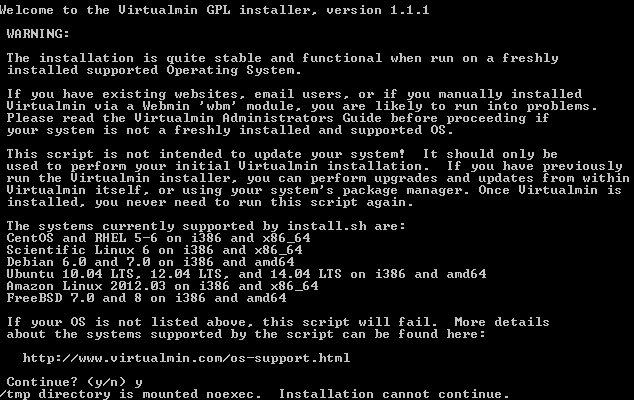 Then, restart the Virtualmin installation. Process above required that you have root privileges. If you don’t, you can modify the Virtualmin install.sh script to bypass the noexec check and assign a new temporary directory for Virtualmin which execution is allowed. Firstly, disable the noexec by commenting the corresponding code. echo "/tmp directory is mounted noexec. Installation cannot continue." #        echo "/tmp directory is mounted noexec. Installation cannot continue." Save the install.sh and run the Virtual installation.